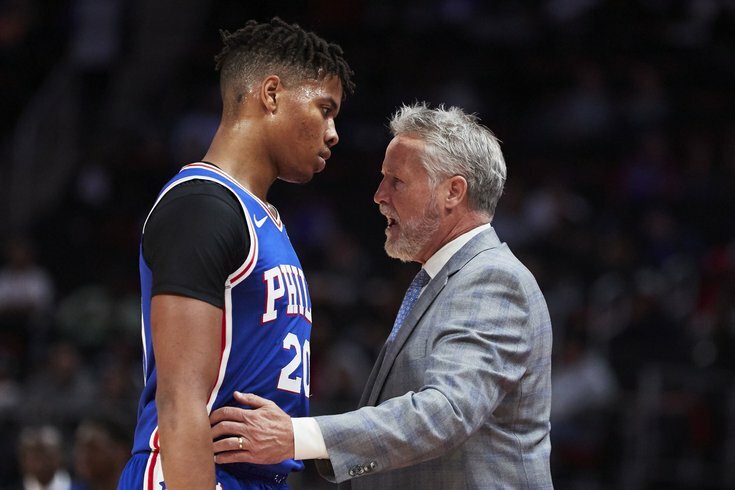 Philadelphia 76ers head coach Brett Brown talks to guard Markelle Fultz (20) in the first half against the Detroit Pistons at Little Caesars Arena. The Sixers have reportedly traded former No. 1 overall pick Markelle Fultz to the Orlando Magic for Jonathon Simmons, a first-round draft pick, and a second-round draft pick, according to multiple reports. This is (not that I need to tell you this) enormous news for the Sixers and also their wild fanbase. The Fultz situation is just about as bizarre as it gets. This was a long time coming, but the fact that a trade is actually here is still incredible. How do fans feel about the trade? They have lots of takes. Mostly, though, they seem excited. The #sixers got a most likely real, albeit late, first-round pick back for Markelle Fultz. The draft pick return is more than I anticipated. My surprise is more the target. I figured they'd prioritize a role player for the stretch run over draft pick compensation. I’ll need an oral history of the Markelle Fultz era in Philly at some point. A 30 for 30 podcast will do fine. Outside of getting rid of Fultz’s headache, was the return on the trade good for the Sixers? Markelle Fultz was worth an expiring contract at most, IMO. Getting more than that is a considerable win. Wishing Markelle Fultz the best. Hope he gets it all together. Except when he plays the Sixers. In those games I want Embiid to block all of his shots into the crowd thus making helmets required headwear for fans when Orlando is in town. Pretty wild that the Sixers have basically nothing of value currently on their team from the 2013, 2015, or 2017 drafts, didn't end up getting anything meaningful from that home-run of a Kings trade, and still have one of the five or so best long-term situations in the NBA. I checked on the chickfila situation in orlando, he'll be ok. If you need a refresher of how we arrived here, PhillyVoice's Kyle Neubeck put the whole situation into perspective almost a year ago to the day. What do you think? Fair value? Glad it’s over? Sad it’s over? Yell at us. Let us know.